The QCT Miami Black Heritage Toursm is the first tour of its kind in that it will take you to places and introduce you to people previously overlooked like Pastor Meddie P. Bannister — first woman of color to lead a Miami congregation of the Church of God of Prophecy; and Dr. Enid C. Pinkney — Miami history preservationist to name a few. 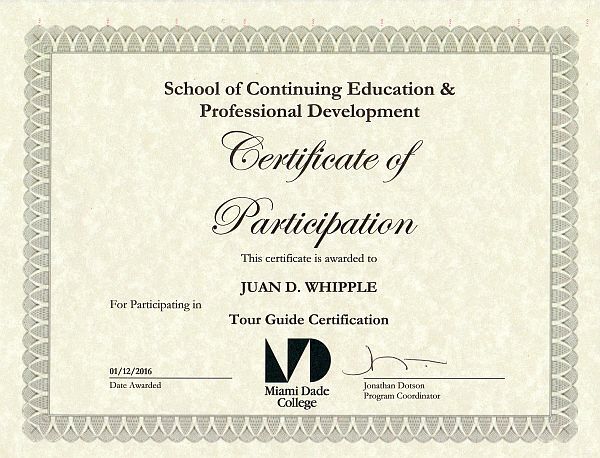 The tour is developed by Mr. Juan D. “Jay” Whipple, a Miami native, who left the area for military service in 1978 upon graduating from Miami Beach Senior High School. He returned here in late 2014 for a five month stay; his longest stint since graduating. “I was completely blown away and a bit intimidated at how much had changed since the late 1970’s when I freely navigated Miami via automobile, my bicycle, the Jitney, city bus, and on foot,” says Whipple. “Fast forward nearly four decades and I found myself literally driving in circles trying to get from here to there,” he said. Whipple took on odd jobs through temp agencies which allowed him to begin the long and arduous process of re-learning the city of his birth. He recalls working in formerly very familiar areas such as Miami Beach, Coconut Grove, Key Biscayne, and even an assignment in Miami Gardens (formerly Carol City) at the then Sun Life Stadium (now Hard Rock). “The Sun Life Stadium assignment brought things full circle for me in that I worked at the old Orange Bowl Stadium in Little Havana while in high school in the late 1970’s and actually got a chance to see up close and personal the entire Dolphin roster; including legendary coach Don Shula – at each home game,” recalls Whipple. Whipple then landed a job with an airport shuttle company located just a few blocks from his mother’s home in the Gladeview Community near the MLK Metrorail station. “It was a blessing and a challenge,” he stated because “I was now being paid to drive around in circles trying to get from here to there.” That job helped him expand his navigational reach from Florida City to the south and as far north as Lake Worth. “It also gave me a chance to interact with both visitors’, newcomers’, and local residences’ from all walks of life,” he said. “After a while I also began giving them brief tours while in route to their destinations.” Whipple decided to leave that job because the 50-plus hours per week did not give him enough time to begin the long process of developing this tour. 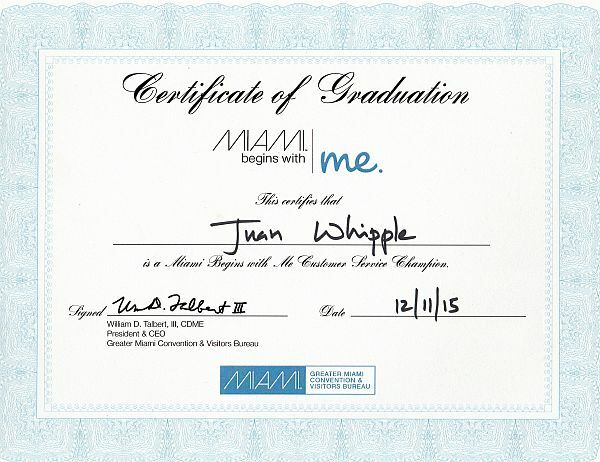 Whipple’s new contractual transportation jobs also gave him the freedom to pursue additional educational credits in history by completing a six week course on Miami history at Miami Dade Community College’s north campus off N.W. 27th Avenue. “I remember going there shortly after it was built in the late 1960’s for a gymnastics class, and later in high school to participate in track meets for Beach High and the AAU (Amateur Athletic Union), as well as practice on my own,” he recalls; “Back then I could actually run from the bottom to the top of those stairs from one end of the stadium to the other.” He was also able to squeeze in some time, between contract ride share shifts, to complete the Miami In Me customer service program sponsored by the Miami CVB, as well as tag along as a tourist on a South Beach walking tour, two double-decker bus tours, a celebrity boat tour around the islands of Biscayne Bay, and a walking tour of Little Havana conducted by history guru Dr. Paul George. Oh, by the way, he is also a travel writer for Trend Magazine Onlinesm. Finally, he was able to spend time conducting research at the Main Public Library Downtown which is one of his favorite places in the Magic City. Whipple’s company – Queen City Tourssm and Travel — is celebrating 25 years of successful service in the travel and tourism industry in North and South Carolina, and have maintained an A to A+ rating with the Better Business Bureau over the past decade or so. They will soon offer free samplings of their QCT Miami Black Heritage Toursm just in time for Black History Month, and future plans include using this tour as a fund-raiser for local historic landmarks like the Dorsey home in the Overtown neighborhood. He has also recently published his third book entitled Black Charlotte From A Tour Guide’s Perspective Part 1 in which he has plans to enjoin with his two other titles – Charlotte From A Tour Guide’s Perspective, and More Charlotte From A Tour Guide’s Perspective – to become his first novel.